From left are Cheyenne Duggins, Jeremy Lewis and Darrel Bender. The Clinton County Connection Chapter of BNI (Business Network International) recently recognized two members for their contribution to the chapter’s success in 2018. 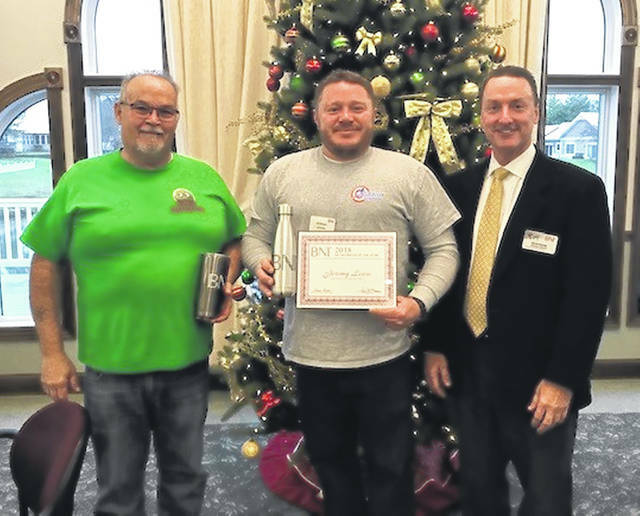 Jeremy Lewis, owner of Absolutely Heating & Air LLC, and Cheyenne Duggins, owner of Duggins Restoration Company, were presented awards by BNI Miami Valley Executive Director Darrel Bender. Lewis received the 2018 Notable Networker Award. Duggins received recognition for his efforts in recruiting members and contributing over $100,000 in closed business to members in the chapter. BNI is a networking organization with chapters all over the world, where members meet weekly to discuss business and support each other’s business by sharing referrals. The Clinton County Connection Chapter of BNI meets weekly on Tuesdays at 7:45 a.m. at Ohio Living Cape May. Visitors are welcome.